Here are the best Treasure Island Florida hotels and resorts which will fit an assortment of budgets and are situated on the beach or within an easy walk to the beach. For families seeking resort style amenities then try the Bilmar Beach Resort. Superb choices for all-suite accommodations with a kitchen or kitchenette then the boutique Crystal Palms Beach Resort, the Island Inn Beach Resort and Residence Inn St. Petersburg Treasure Island which offers more value with free breakfast. Budget friendly places with a kitchen or kitchenette can be found at the Tahitian Beach Motel and the Surf Beach Resort. For comfortable mid-range accommodations try the Thunderbird Beach Resort and the Treasure Bay Resort and Marina boasts a free breakfast. Active budget travelers will find great value at the iBeach Resort and the Treasure Island Ocean Club. The Crystal Palms Beach Resort is an ideal mid-range boutique Treasure Island Florida hotel for families and all types of visitors that are seeking easy beach access and apartment style accommodations. Located north of downtown Treasure Island near Isle of Palms, the Crystal Palms Beach Resort is situated directly across the street from the beach and offers great access to downtown Treasure Island as well as John’s Pass Village and Boardwalk. The Crystal Palms Beach Resort has a modern six floor architectural style with Art Deco ascents and 36 suites which feature an Art Deco decor. All suites are furnished with floor to ceiling windows and a private balcony that sports views of the Gulf of Mexico. One-bedroom are sized at 825 square feet with a separate living and a full kitchen. Two-bedroom suites have 925 square feet with a separate living room, 2-bathrooms and a full kitchen. Three-bedroom penthouse suites boast 1,850 square feet with a separate living room, dining room, full kitchen, 3-bathrooms and an expansive outdoor living space. The Crystal Palms Beach Resort is a short 5-minute walk to the beach where you will find white sand to lounge on and great swimming conditions. You can arrange for several watersport adventures as well as rent your favorite watersport equipment at the beach or in nearby Hubbard’s Marina. The hotel is within a 20-minute drive to attractions such as the Clearwater Marine Aquarium, Fort De Soto and Pier 60 in Clearwater Beach. The Crystal Palms Beach Treasure Island Florida hotel has a superb freshwater swimming pool with a nice sundeck surrounded by a tropical garden and in-room massages are available. There is no fitness center onsite but you are within walking distance to Treasure Island Athletic Club. Dining begins with a leisurely home cooked meal in your suite and offsite choices within walking distance include Britt’s Coal Fire Pizza, the Pearl Restaurant for seafood as well as BRGR Kitchen and Bar. Nightlife can be found at Sloppy Joe’s for live music and CJ’s On The Beach offers karaoke or you can take a quick drive to John’s Pass Village and Boardwalk where you will find multiple entertainment venues. When you are searching for a mid-range Treasure Island Florida hotel that is ideal for families and offers value as well as direct beach access then the Residence Inn St. Petersburg Treasure Island is a perfect choice. Located north of downtown Treasure Island near the Isle of Palms area, the Residence Inn St. Petersburg Treasure Island is situated directly on the beach and is less than 1-mile away from John’ Pass Village and Boardwalk. The Residence Inn St. Petersburg Treasure Island Florida hotel has a modern nine story architectural design with 105 suites which feature a contemporary interior. All suites are furnished with floor to ceiling windows and a private balcony that overlooks the Gulf of Mexico. Studios are sized at 351 square feet with an open floorplan with a king size as well as a small kitchenette (microwave and refrigerator). One-bedroom suites have 675 square feet with a separate living room and sofa sleeper, a full kitchen and 2-balconies. Two-bedroom suites are sized at 814 square feet with a separate living room, 2-bathrooms, full kitchen and some units have wraparound balconies. Three-bedroom suites offer 996 square feet with a separate living room, a full kitchen and some units have a wraparound balcony. 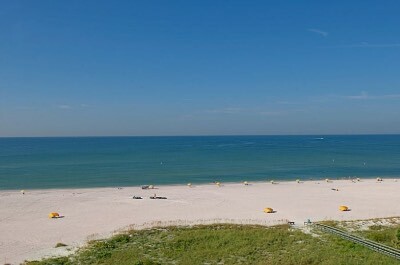 The Residence Inn St. Petersburg Treasure Island has a perfect spot one the beach where you will find plenty of space to lounge and swim. You can arrange for your favorite watersport equipment or adventure onsite. You are also within a short distance to many attractions such as the Alligator Attraction, Dolphin Quest and children like the Beach Fun and Games arcade. 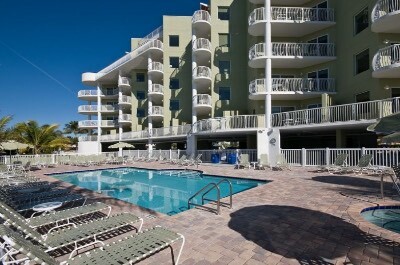 The Residence Inn St. Petersburg Treasure Island Florida hotel has a superb freshwater swimming pool with sundeck that overlooks the Gulf of Mexico and a fitness center. Dining includes a complimentary breakfast daily as well as an evening social Monday thru Wednesday evenings. There is grocery service available for a nice home cooked meal and offsite dining selections within walking distance include Shrimpy’s Blues Bistro, the Boardwalk Grill and VIP Lounge and Restaurant serves Mexican cuisine. Nightlife is fabulous at John’s Pass Village and Boardwalk where you will find street performers, live music and other entertainment venues. The Treasure Island Ocean Club is a superb budget Treasure Island Florida hotel for travelers and families looking basic accommodations with direct beach access. 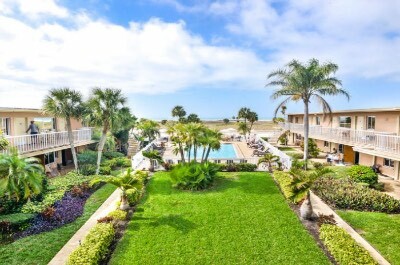 Located north of Treasure Island near Isle of Palms, the Treasure Island Ocean Club is situated directly on the beach with a manicured garden that overlooks the Gulf of Mexico. The Treasure Island Ocean Club has a Modern two floor architectural style with 50 rooms which boast a modern decor. All rooms are furnished with a small kitchenette which includes a microwave and refrigerator. Pool view rooms are the smallest with a choice of bedding. Garden view rooms have 450 square feet with a choice of bedding as well as a sofa sleeper. Beach view units have varying floorplan some a separate bedroom while other have an open floorplan with a choice of bedding and a sofa sleeper. The Treasure Island Ocean Club sports a 300-feet beachfront along the Gulf of Mexico which is ideal for lounging, swimming and there is a wide variety of watersport activities as well as watersport equipment for rent. The property is close to several major attractions and is within 1-mile of John’s Pass Village and Boardwalk as well as downtown Treasure Island. You will also find an easy 50-minute drive to Busch Gardens Tampa. The Treasure Island Ocean Club Florida Hotel has a nice swimming set within a manicured courtyard and there is a pool bar onsite. The property does not offer a fitness center or restaurant onsite. Dining choices offsite within walking distance include Middle Grounds Grill, Ricky T’s offers pizza and the R Bar serves pub style fare. Nightlife within walking distance includes Sloppy Joe’s for live music for karaoke nights or you can drive a short distance to Bongos Beach Bar and Grille as well as Level 11 Rooftop. The Thunderbird Beach Resort is a fantastic mid-range Treasure Island Florida hotel for all types of travelers and families who are seeking direct beach access. 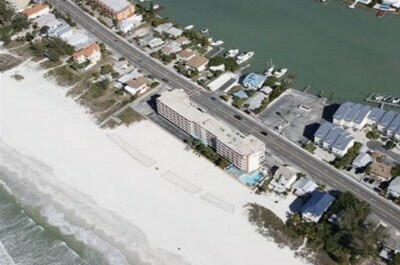 Located in the heart of Treasure Island, the Thunderbird Beach Resort is situated directly on Treasure Island Beach and is within a 20-minute walk to John’s Pass Village and Boardwalk. 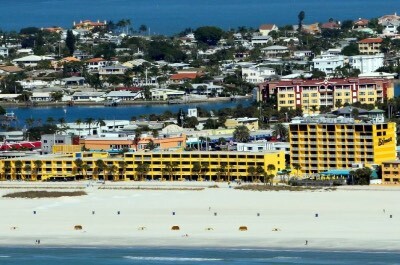 The Thunderbird Beach Treasure Island Florida hotel has a modern three story architectural design with 106 rooms and suites which feature a contemporary interior. Rooms are 380 square feet with a small kitchenette (microwave and refrigerator) and a view of the pool from large picture windows or a private gulf front balcony. Efficiency units have 400 square feet with a kitchen area and view of the pool from large windows or a gulf front balcony. These rooms and efficiency units can be combined for more sleeping room for families. One-bedroom suites have a full kitchen, a separate living room and a poolside shared balcony or a view of the gulf from large picture windows. The Thunderbird Beach Resort has a great spot on Treasure Island Beach where you will find plenty of white sand, beach volleyball courts and perfect swimming conditions. You can arrange for your favorite watersport adventure at the Dolphin Marine rentals as well as watersport equipment. The Thunderbird Beach Treasure Island Florida hotel is near the Treasure Island Beach Boardwalk which is superb for jogging and walking. The resort is nearby many attractions such as Treasure Island Golf, Tennis and Recreation Center, the Beach Escape Game and you are a short drive from Florida Orange Groves and Winery. The resort has a freshwater swimming within a nice manicured courtyard that has barbeque grills as well as poolside service at Ikki Woo Woo’s Tiki Bar and you have complimentary passes to the Treasure Island Athletic Club. There is a not a restaurant onsite and offsite dining choices within walking distance are numerous including Foxy’s Cafe, Sloppy Joe’s and Gigi’s Italian Restaurant. Nightlife is perfect onsite at the Ikki Woo Woo’s Tiki Hut which features live music seven nights a week poolside. 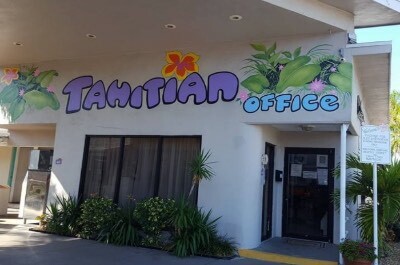 When you are searching for a budget Treasure Island Florida hotel that boasts great beach access and is superb for active travelers as well as families then try the Tahitian Beach Motel. Located on the northern section of Treasure Island near Isle of Palms, the Tahitian Beach Motel is directly on Treasure Island Beach and is within 1-mile to John’s Pass Village and Boardwalk. The Tahitian Beach Treasure Island Florida hotel has a modern two floor architectural style with 53 rooms and suites that sport a modern interior. Efficiency units have an open floorplan with a kitchenette and choice of bedding with views of Clearwater Bay or the Gulf of Mexico. Suites are larger with a separate full kitchen, a choice of bedding, an integrated sleeping/living area that has a sofa sleeper and there are poolside or beach views available. One and two-bedroom apartments have a separate living room, a kitchen area and views of the courtyard fountain. The Tahitian Beach Treasure Island Florida hotel allows for perfect beach fun at Treasure Island Beach where you will find lots of room to lounge, great swimming conditions and there are numerous places to rent your favorite watersport equipment. The motel is also close to many attractions like Hubbard’s Marina, Dolphin Quest and Fort De Soto is less than 12-miles away. The Tahitian Beach Motel has a freshwater swimming pool and a front patio with barbeque grills which is overlooking the Gulf of Mexico. Dining onsite includes a leisurely meal within your room and offsite dining choice within walking distance include Britt’s Coal Fire Pizza, BRGR Kitchen and Bar as well as the Floridian prepares Cuban dishes. Nightlife can include a relaxing drink at the Cigar Republic or the Ka’Tiki and there is always live entertainment at John’s Pass Village and Boardwalk. 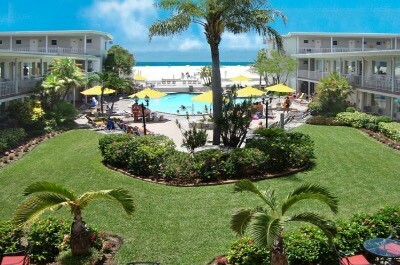 Island Inn Beach Resort is an ideal mid-range Treasure Island Florida hotel offers direct beach access and is great for families as well as all types of travelers. Located towards the southern portion of Treasure Island, the Island Inn Beach Resort is directly on the beach and just north of Sunset Beach. The Island Inn Beach Resort has a modern six floor architectural design with 81 rooms and suites that boast a contemporary decor. All rooms and suites have a private balcony with views of the Boca Ciega Bay or the Gulf of Mexico. Bayside rooms have two double beds and a kitchenette. Bay view efficiency units are slightly larger with a choice of bedding and a kitchenette. Gulf Front State rooms are large with a choice of bedding and a kitchenette. One-bedroom Bay View suites have a separate living room with sofa sleeper and a kitchenette. The one-bedroom Gulf View suite is slightly larger with one-bedroom, a living room and sofa sleeper, 2-bathrooms, kitchenette and 2-balconies. The three-bedroom Penthouse suite features 3-bathrooms and a full kitchen. The Island Inn Beach Resort has a great spot along Treasure Island Beach where you will find plenty of room to lounge on the white sand with ideal swimming conditions. There are numerous vendors on the beach for you to arrange your favorite watersport activity or rent watersport equipment. Other attractions within a short drive include the Boca Ciega Aquatic Preserve, the Alligator Attraction and Busch Gardens Tampa is only 45-minutes away. The Island Inn Beach Resort has a freshwater swimming pool with a sundeck and Tiki bar as well as barbeque grills. There is not a fitness center or restaurant onsite. Dining selections offsite within walking distance include the Pearl Restaurant, Ricky T’s for pizza and Foxy’s Cafe. Nightlife can include live music at Sloppy Joe’s, a walk along sunset Beach or just a quiet night on your balcony. When you are searching for mid-range Treasure Island Florida hotel that is perfect for families and allows for easy beach access as well as a marina then the Treasure Bay Resort and Marina is ideal. 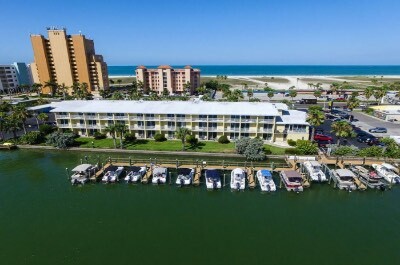 Located on Treasure Island along the east side of Gulf Boulevard, the Treasure Bay Resort and Marina are situated directly across the street from Treasure Island Beach with an associated marina that can accommodate for boat arrivals. The Treasure Bay Resort and Marina have a modern three floor architectural style with 83 rooms that sport a beach interior. All rooms feature a private balcony or terrace with views of the marina, pool or Gulf of Mexico. Rooms are sized at 302 square feet with a choice of bedding, a small kitchenette (microwave and refrigerator) and choice of view with poolside rooms allowing for direct access to the pool. The Treasure Bay Resort and Marina is a 5-minute walk to Treasure Island Beach where you will find an expansive area of wide white sand that stretches for 3-miles. The beach area has plenty of facilities like beach volleyball courts, rental cabanas, watersport equipment rentals and the swimming is good along the shoreline. The Treasure Bay Resort and Marina Treasure Island Florida hotel boasts easy access to several attractions in the area including John’s Pass Village and Boardwalk, as well as Sacred Lands Preservation and Education and your children will enjoy taking a photograph with Bucky Big Pirate of Treasure Island. The Treasure Bay Resort and Marina are superb if you are arriving by water with plenty of dock space for you to moor. The property has a freshwater swimming pool with a sundeck as well as a rooftop sundeck and a fitness center. Dining includes a complimentary breakfast daily and the Cabana Bar offers drink service until two hours after sunset. Dining choices within walking distance to the resort are Middle Grounds Grill, Shrimpy’s Blues Bistro and the VIP Lounge and Restaurant serves Mexican cuisine. Nightlife at the property includes a stunning sunset from the rooftop terrace or a walk to CJ’s on the Island has karaoke and the Freefall Theatre has live performances. Families that are looking for a mid-range Treasure Island Florida hotel which offers resort style amenities and is directly on the beach should stay at the Bilmar Beach Resort. Located in the heart of Treasure Island Beach, the Bilmar Beach Resort boasts direct beach access and is only a 5-minute drive to John’s Pass Village and Boardwalk. The Bilmar Beach Treasure Island Florida hotel has a modern architectural design with 164 rooms and suites which feature a Florida beach decor. Standard rooms are 225 square feet with a queen size bed, a small kitchenette (microwave and refrigerator) and views of the courtyard. Gulf Front Shell Studios have 297 square feet with two queen size beds, a small kitchenette and views of the gulf from picture windows. Gulf Front Efficiency units are sized at 328 square feet with a breakfast bar, full kitchenette and a private balcony with gulf views. Poolside Efficiency units have a similar floorplan without the balcony. Deluxe Gulf Front Studios have 396 square feet with an open floorplan that includes an integrated sleeping/living/kitchen area and a private balcony with gulf views. There are also one and two-bedroom suites available in three varieties of floorplans as well as three one-bedroom penthouse suites which can be combined with a room for a two-bedroom unit. The Bilmar Beach Resort has perfect access to Treasure Island Beach that features plenty of space to relax, beach volleyball courts, swimming is good and you have access to complimentary kayaks as well as standup paddleboards. The property provides for free usage of beach cruisers so you can explore the surrounding area. The Bilmar Beach Treasure Island Florida hotel is within a short drive to several attractions such as the Boca Ciega Bay Aquatic Preserve, Dolphin Quest and Smugglers Cove Adventure Golf. The hotel has a several resort style amenities such as two freshwater swimming pools with nice sundecks, a rooftop terrace with sofas, a fitness center and guest membership at the Seminole Lakes Golf Country Club. Dining onsite incudes the Bilmar Beach Cafe for breakfast and lunch as well as Sloppy Joe’s for lunch and dinner. Offsite dining selections within walking distance include Gigi’s Italian Restaurant, Pearl Restaurant and the Floridian serves Latin fare. Nightlife onsite includes live music at Sloppy Joe’s every evening and there are family movie nights under the stars or you can enjoy the beachside fire pits as well as the rooftop terrace. The iBeach Resort is an ideal selection when you are searching for a Treasure Island Florida hotel that is directly on the beach and is prefect for all types of travelers including families that are on a budget. The iBeach Resort has a modern two story architectural design with 16 rooms and apartment style units which boast a modern decor. There are no balconies at this property and rooms offer views of the pool area or the Gulf of Mexico. Standard rooms are 300 square feet with two beds, a small kitchenette (microwave and refrigerator). Efficiency units sport 400 square feet with two beds, a full kitchen and integrated living/sleeping area. One-bedroom apartments are 550 square feet with a choice of bedding, a full kitchen, a separate living room that boasts a sofa sleeper. The iBeach Resort has a perfect spot on Treasure Island Beach where you will find one of the widest beaches with white sand in the area. Activities at this area include swimming, beach volleyball and assortment of beach games. You can easily find vendors to book your favorite watersport adventure along the beach area and Dolphin Marine Rentals is less than 1-mile from the property. The iBeach Resort is ideal for starting adventures of the area with John’s Pass Village and Boardwalk, McKenney Park and children will like Beach Fun and Games for arcade style entertainment. The iBeach Treasure Island Florida hotel has a freshwater swimming pool with a sundeck that features barbeque grills and shuffleboard. There is no fitness center onsite but you are only 1-mile from the Treasure Island Golf, Tennis and Recreation Center. There is not a restaurant onsite and dining options within walking distance include the VIP Lounge and Restaurant for Mexican dishes, Ricky T’s has pizza and Sloppy Joe’s Treasure Island serves seafood. Nightlife includes a short walk to Ka’Tiki or you can take a short drive to Bongos Beach Bar and Grille. 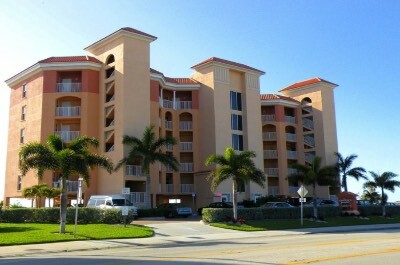 The Surf Beach Resort is a great choice for a Treasure Island Florida hotel for families who are seeking a value oriented condominium style property directly on the beach. Located in the heart of Treasure Island, the Surf Beach Resort boasts easy access to the white sands of Treasure Island Beach and is just 45-minutes by car from Busch Gardens Tampa. The Surf Beach Resort has a modern six floor architectural style with 30 two-bedroom condominiums that feature a contemporary decor. Two-bedroom condominiums are sized at 688 square feet with a separate living room that features a sofa sleeper, a full kitchen, in-unit launderette and a private balcony that boast views of the Gulf of Mexico. 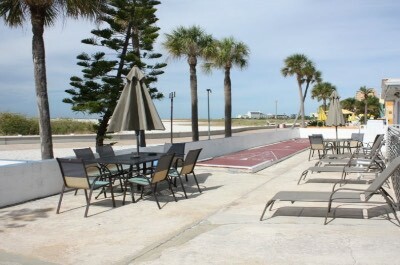 The Surf Beach Treasure Island Florida hotel is directly on the beach where you will find plenty of white sand with picnic tables, barbeque grills, a beach volleyball court as well as cabanas to rent. Swimming is good and you can arrange your favorite watersport adventure directly on the beach or at a nearby rental shop. The Surf Rider Resort offers easy access to several attractions such as John’s Pass Village and Boardwalk, Hubbard’s Marina or you can try the Alligator Attraction at Madeira Beach. The Surf Rider Resort resides along the Treasure Island Beach Boardwalk where you will recreational opportunities. The hotel has a nice freshwater swimming pool with a sundeck complete with barbeque grills that overlooks the Gulf of Mexico. The Surf Rider Resort does not have a fitness center but you can walk to Treasure Island Athletic Club. Dining includes a leisurely home cooked meal in your room and offsite dining options within walking distance include Middle Grounds Grill for seafood, Shrimpy’s Blues Bistro serves Creole as well as Britt’s Coal Fired Pizza prepares Italian cuisine. Nightlife at this Treasure Island Florida hotel include watching the sunset from your balcony and you can walk to CJ’s On The Island, the Cigar Republic and the Freefall Theatre Company has live performances.